Antique holiday postcards are an affordable collectible. Antique Christmas postcards are an affordable collectible favored by many collectors. The practice of collecting postcards of all types is called "deltiology" and those who collect consider the years from 1900 to 1920 to be the golden years of postcards. The first Christmas cards originated in England in the early 1840s. A man named Sir Henry Cole wanted to encourage his numerous friends to consider the poor at Christmas time and yet it would be impossible to write to each one individually. He commissioned John C. Horsley to design a card that would convey his greetings and his reminder as well. The card had three panels, a center panel of a happy family celebrating with panels of the poor and destitute on either side. The card said simply, "A Merry Christmas and a Happy New Year to You." The custom of sending Christmas cards became popular and soon Christmas cards were being sent and received by almost everyone during the holiday season. The cards became more and more elaborate, often decorated with fabric embellishments. Cards were imported from England to America until 1875 when Louis Prang opened a lithographic shop and published the first American Christmas postcards. His first attempts featured nature scenes totally unrelated to Christmas. 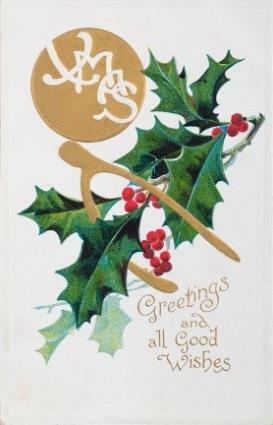 By 1881 Prang's company was producing more than five million Christmas cards annually. These were still cards in envelopes because postcards had not been developed yet. John Charlton patented the first postcard in 1861 but the post office was the only agency that was licensed to print and produce postcards until 1898. At this time Congress passed the Private Mailing Card Act which allowed publishers to create cards for mailing. According to law, they could not be called postcards and could not have a divided back, so they were called private mailing cards. On December 24, 1901 the government released the word "postcard" for use by private companies. The postcards could only have the message on the front of the card and the backs were left for the address. This meant there was very little space for artwork. On March 1, 1907 the post office began to allow postcards with divided backs where the address was written on one side and the message on the other. This left the front available for designs. It was at this point that Christmas postcards became popular. It is safe to say that most American antique holiday postcards you will find will have been made after 1906, although you might find a few made prior to that, especially from European countries. Some Victorian images have remained popular; however, other images have fallen out of favor to be replaced by more modern designs. The earliest Christmas postcards showed flowers, fairies, and gardens that were more geared toward the arrival of spring. Whether the postcard depicts Santa in a Model T or a sailing ship, transportation motifs could be found on many cards. Even early airplanes are depicted in these holiday greetings. These help to date the card as well; obviously a 1927 Packard would not be found on a card from 1910. Postcards with Santa Claus on them are popular among collectors. Blue Santas and other non-traditional images of St. Nick are among the most valuable to collectors. Patriotic Santa images are also popular. Angels have always been associated with Christmas and there are a variety of cards with both angels and religious scenes on them. Scenes from nature depicting woods, ponds, or seasides can be found on Christmas postcards. Some of these are obviously done in the Craftsman style while others are more Victorian. Antique Christmas postcards are evaluated like any other antique postcard. There are many details that contribute to the ultimate value of the card. Age - How old is it? Condition - While having a handwritten signature will probably not affect the value of a postcard, tears and folds will. A postcard with bright colors and clean edges will fetch more than the same card if it is battered. Rarity - Some designs or companies are rarer than others and thus can command higher prices. Design - Certain designs, Uncle Sam Santa's for example, are eagerly sought after by collectors. Provenance - Christmas postcards signed by Marc Twain would command a higher price than the same card signed by an unknown person. Other factors contribute to final value of the postcard so it is a good idea to check the completed auctions on eBay or to get a book like, Vintage Postcards for the Holidays: Identification & Value Guide by Robert and Claudette Reed which is available at Amazon.com. Cards should be stored in special acid free sleeves to keep them bright and in good condition. Avoid touching them because the acids and oils found naturally on your skin can eat away at the paper over time. These older dyes are not light resistant and they will quickly lose color if exposed to sunlight. Keep your postcards in an album or box created especially for this purpose. A great way to use these amazing images is to scan them to your computer and then print them for use as Christmas postcards, gift tags, and even decorations for your holiday tree. Most postcards are less than five dollars on eBay and other auction sites so they are a fun, easy collectible.